FOXBORO, Mass. – Heading into halftime deadlocked in a low scoring affair, Foxboro head coach Jon Gibbs didn’t need to make many tactical adjustments. The simple truth was the Warriors just needed to convert their opportunities on the offensive end of the floor. Foxboro’s stout defense got the job done over the first 16 minutes of play, holding #13 New Mission to just 19 points on 36% shooting. But the Warriors’ offense was struggling to establish a rhythm. The Warriors shot just 24% (6-for-25) from the field in the first half and went over five minutes without any points at one point during the first quarter. And despite open layup chances and open looks from beyond the three-point line, Foxboro didn’t convert back-to-back chances once. With the defense continuing its strong work in the second half, the offense finally settled in. The Warriors scored 41 points in the second half en route to a comfortable 60-43 win over the Titans. Foxboro didn’t miss many of their open looks in the second or many of their shots at all. The hosts hit 16-of-25 attempts (64%) from the field in the second half, scoring as many points in the third quarter as they did the entire first half (19). Bobby Harrison (eight points) scored on a nice cut to the basket on the opening play of the quarter, Joe Morrison (20 points, six rebounds, six assists, four steals) drained a three on the next trip up, hit one of two free throws after that to take a 25-21 lead. New Mission stayed within two thanks to freshman Abukar Aden (eight points) but Foxboro finished the third quarter with an 11-5 run. Morrison scored on one end, drew an offensive charge call on the other, and came back down to hit a three to spark the run. Senior Teddy Maher got around his man for an easy layup, Matt Rongione came away with a steal and passed to Morrison for a layup, and junior Anthony Mollica (15 points) scored on a strong take to the basket in the final seconds. Holding a 38-29 lead going into the fourth quarter, Mollica helped the Warriors put the game to bed. The junior scored half of Foxboro’s 22 fourth quarter points. He connected on Foxboro’s first shot of the quarter — a three off a feed from Morrison — and then scored off the dribble to make it 43-33. 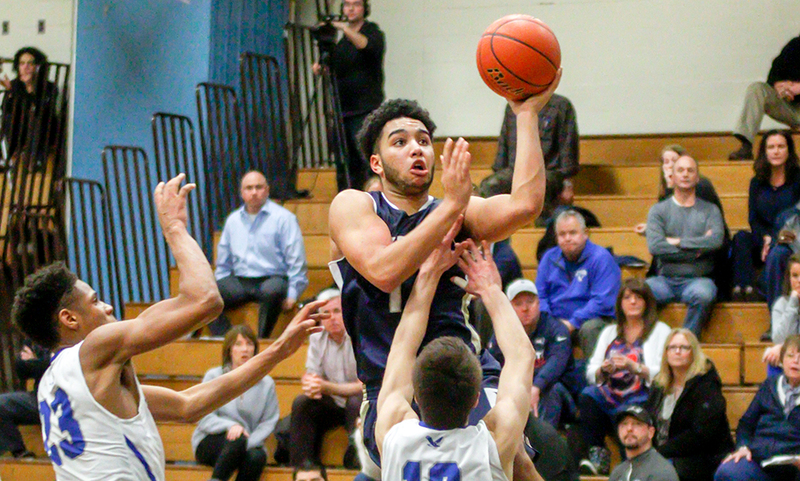 Mollica dropped back-to-back baskets and sophomore Brandon Borde (13 points) drove right up the middle for two to put Foxboro up 50-35 with just under four minutes to play. 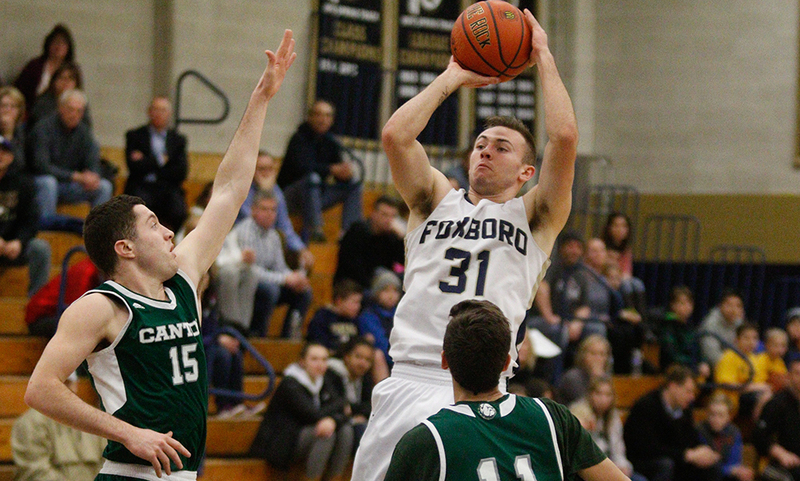 Foxboro continued its run, rattling off 10 straight points to complete a 16-0 spurt. Morrison and Borde each added four points in the stretch while Mollica had two more. Foxboro boys basketball (19-4) advances to the D2 South Quarterfinals and will host #5 Hanover (18-4). The game is currently scheduled for Monday, March 5th at 6:30 but is subject to change. FOXBORO, Mass. 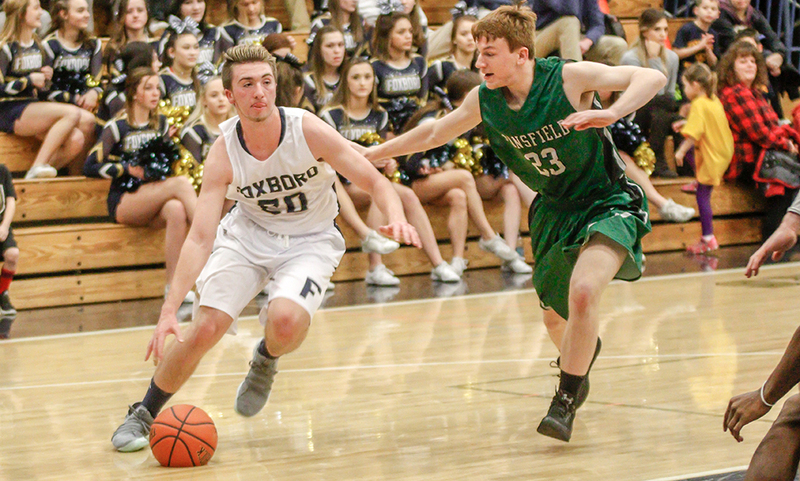 – After falling on the road to Milford last Friday night, the Foxboro boys basketball team fell a game behind in the race for the league’s Davenport division title. But the Warriors entered this week with control over their destiny, and they didn’t let the opportunity slip away. 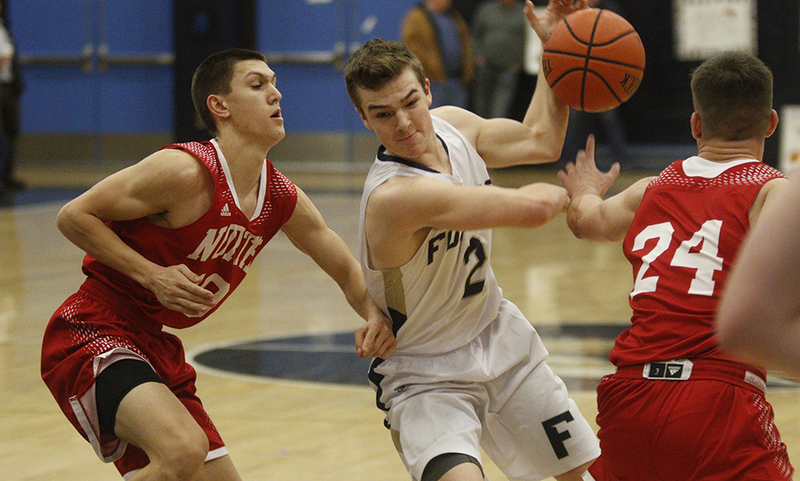 Following a big win over Canton on Tuesday evening, Foxboro used a big third quarter surge to create separation and earn a 56-38 win over North Attleboro, clinching a share of the program’s second Davenport title in the past three years. Foxboro held a five-point lead (13-8) after eight minutes of play and stretched the advantage to seven (30-23) at the halftime break. North Attleboro’s Josh Montague (10 points) scored at the midway point of the third quarter to keep the deficit at seven, but that’s when Foxboro blew the game open. The Warriors rattled off a 13-1 run over the final four minutes of the third quarter. Senior Matt Rongione (six points, five rebounds, three assists) started the run with a three in the corner off a feed from senior Teddy Maher, sophomore Brandon Borde (16 points, five rebounds) converted a strong take to the basket and Anthony Mollicaa hit a free throw for a 6-1 run. Over the final 60 seconds, Foxboro added seven more points. Joe Morrison (19 points, three assists) scored and then set up Borde for another basket. And then just before the buzzer sounded, Borde returned the favor, finding Morrison for a triple at the end of the period. “I felt like the run was coming all along,” said Foxboro head coach Jon Gibbs. “I felt our defense had been pretty good. At times North made some tough shots and we missed some easy ones. I felt like it was just a matter of time until we made the run and we started finishing pays in transition. The run gave the hosts a 51-32 advantage heading into the final period. Despite limiting Foxboro to just five points in the final frame, North Attleboro was unable to mount a comeback attempt as the Rocketeers scored just six points in the final eight minutes. “I thought we worked hard, that’s been true most of the year,” said North Attleboro coach Sean Mulkerrins, “We had a couple of breakdowns, we let Morrison get way more touches than we wanted. Give them a lot of credit, their back cuts hurt us in the first half and we weren’t able to react or adjust enough. Foxboro’s defense helped build the lead early on. Despite North shooting 50% from the field in the opening quarter, the Rocketeers had eight turnovers in eight minutes. The Warriors capitalized with senior Bobby Harrison (11 points) accounting for nearly half of the first quarter points with six. Both offenses came alive in the second quarter. Foxboro led by seven twice early on in the quarter, while the Rocketeers cut it down to three two times. Morrison’s traditional three-point play made it 19-12 but a three from Nate Gonsalves and back-to-back baskets from Jake Petersen (10 points, five rebounds) and Montague brought the visitors within three. Chad Peterson kept it a three-point game with a nice pull-up but consecutive triples from Harrison and Morrison gave Foxboro a 30-21 lead with just over a minute left. “They are well coached, they make good reads,” Mulkerrins said of Foxboro. “That’s the toughest thing to defend because it’s not a set thing. Our kids were working hard but we aren’t as experienced as they are and that showed tonight. When teams make runs we need someone to step up and tonight, I appreciate the guys trying, we just didn’t make the shot or get the stop or get the call. 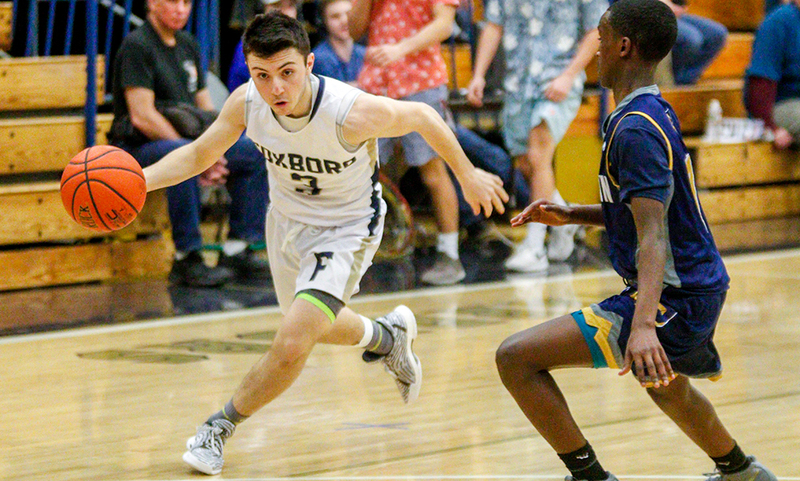 Foxboro boys basketball (12-4 Hockomock, 16-4 overall) will close out the regular season with a pair of non-league games starting on Monday with a visit from Bishop Feehan. anorth Attkbopp(6-10, 8-10) needs to win both of its remaining games to earn a playoff berth. The Rocketeers will host rival Attleboro on Monday at 6:30. CANTON, Mass. – In a game when points are at a premium, even the smallest of runs can make the biggest difference. After six lead changes in the third quarter alone, Canton rattled off an 8-0 burst over a two-minute span to give the Bulldogs their largest lead of the game. The hosts never looked back from there, earning a key 61-48 win over Foxboro to give the Bulldogs sole possession of first place in the Davenport. 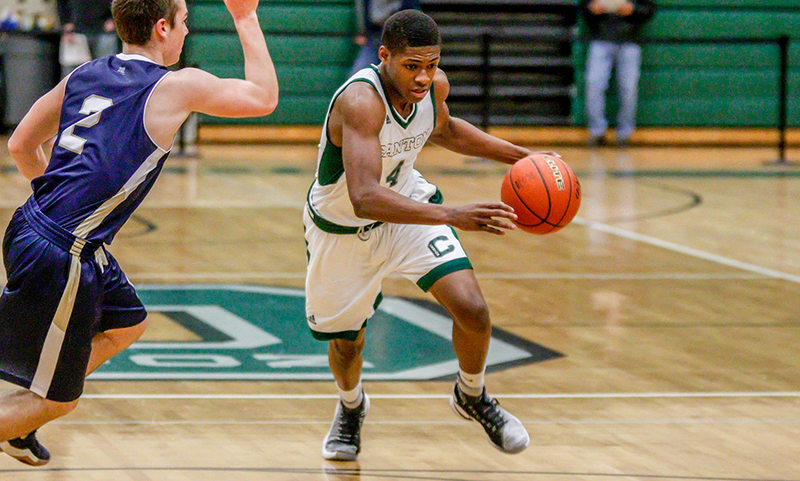 Canton junior Devin Foster (24 points, five rebounds) banked in a step-back three-pointer at the buzzer of the third quarter to give the Bulldogs a 44-43 lead, and arguably, more importantly, the momentum heading into the fourth quarter. The Bulldogs led by one (10-9) at the end of the first and a late three from Foxboro senior Teddy Maher sent the teams into the locker rooms tied 26-26. Neither side led by more than six points through three-quarters of play. After Foxboro scored the first basket of the fourth to retake the lead, 45-44, the Warriors’ offense went quiet. Canton’s Tony Harris (23 points, six rebounds) started the run with a pair of free throws, Foster drained a deep three from straight away, and after a steal from Ryan Lentol, Harris hit a trey of his own to give the Dogs its largest lead at 52-45 with 3:32 to play. The Warriors couldn’t answer as they had a turnover on the ensuing possession and then three straight misses. With just over a minute left and the shot clock winding down, Foster took his man baseline and finished at the rim for a 54-45 lead. 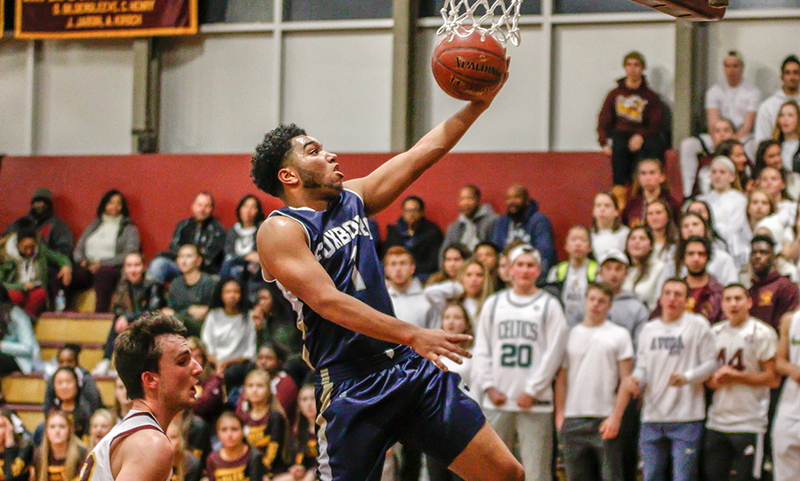 Foxboro finally broke its scoreless streak (spanning 6:20) when sophomore Brandon Borde (17 points, seven rebounds) hit a pair of free throws to cut the deficit to seven, but Canton hit seven of nine free throw attempts in the final minute while the Warriors went without a field goal. Canton outscored Foxboro 17-5 in the final frame. “Foster’s three at the end of the third quarter I think really changed the momentum of the game,” said Foxboro head coach Jon Gibbs. “I think it gave Canton a big boost and kind of sucked away some of our energy, unfortunately. Canton was obviously very well prepared and they were prepared to take away some of the things we like to do offensively and they were able to make things really difficult on us. Give Canton credit for their defense. I think it had to do with their defense more than anything else. Canton built a 10-4 lead through the first seven minutes of the first quarter, holding the Warriors to just 1-for-11 shooting. 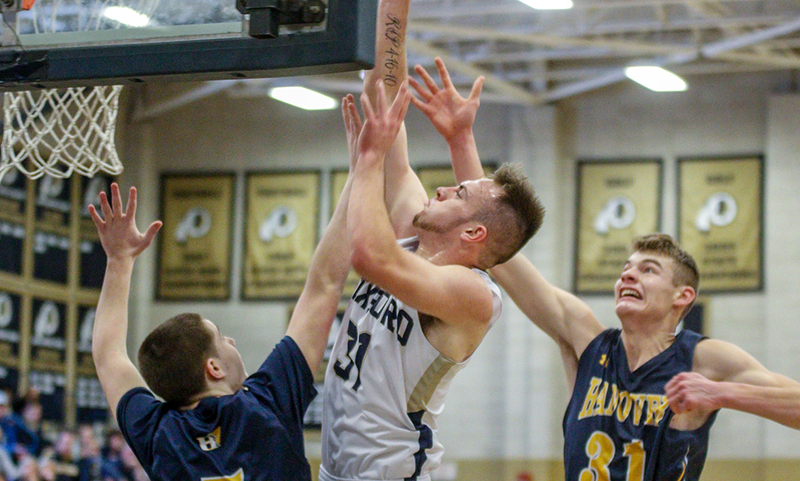 But after hauling in an offensive rebound, Joe Morrison (17 points, seven rebounds) drained a three and Borde scored on a layup on the next possession to bring Foxboro within one after eight minutes. The Bulldogs never trailed in the second period either, but couldn’t pull away thanks to Foxboro’s work on the offensive glass. Harris had a three erased when Borde answered off of Morrison’s offensive rebound. Jake Verille gave Canton its largest lead of the first half with a layup (19-13) but Borde converted at the rim, later hit a free throw and Morrison hit a pair of free throws to get Foxboro within one. Harris finished a traditional three-point play only for Borde to keep Foxboro close with a triple. Foster and Bobby Harrison traded baskets, Austin Maffie then put Canton up three, but Maher’s triple tied the game. In the third quarter, Morrison hit a three to put Foxboro up 29-28, only for Foster to convert to give Canton the lead back. Morrison drained another triple but four straight from Foster put Canton ahead again. Matt Rongione went on a personal 5-0 run and two free throws from Borde gave Foxboro its biggest lead (40-35) with 2:30 in the third. Kyle Fitzgerald and Lentol scored back-to-back but a three from Anthony Mollica kept Foxboro up four. Harris brought Canton within two before Fitzgerald’s offensive rebound set Foster up for his buzzer beater. Canton boys basketball (6-1 Hockomock, 8-1 overall) moves into sole possession of first place of the Davenport and will be in action again on Friday at Stoughton. Foxboro (5-2, 9-2) will look to bounce back the same night when it travels to North Attleboro. FOXBORO, Mass. – Foul shots had plagued Foxboro all night. As a team, the Warriors hit just 18-of-30 (60%) freebies. But when senior Bobby Harrison stepped to the line with his team up three points with 20 seconds left, he delivered. Twelve seconds later, after a wild step-back three from Milford’s Cam Falcon brought the visitors within two, he iced the game with two more to give Foxboro a 55-51 win over Milford. Harrison had the opportunity to ice the game thanks to senior captain Joe Morrison’s fourth-quarter takeover. Morrison scored 15 of his game-high 22 points in the fourth, including a deep, stare-down trey after a jab step to give the Warriors a 48-41 lead. “Joe Morrison stepped up and hit a couple huge threes for us. He does it all for us, he’s incredibly clutch, he’s an unbelievable winner,” Gibbs said. Although he recorded a game-high 22 points, Morrison went scoreless in the first and third quarters. “Even though he struggled offensively at times, he made big shots,” Gibbs said. In those same quarters, Foxboro scored just seven and nine points respectively. They went over two minutes without a point to start the second half. Milford led for most of the game, but couldn’t extend the advantage more than six points. Neither team could find the offense to pull away, as there were five lead changes in the last two and half minutes of the first half. Milford received 28 of its 51 points from the starting frontcourt of Kayden Kelley (16 points) and Andrew Fraioli (12 points). Defensively, the duo protected the rim throughout the game and made it tough for Foxboro in the paint. Kelley especially dominated on both ends, altering shots at the rim and showing impressive inside-out skill on offense, controlling the glass as well. Milford’s team defense locked in especially in the second half. They held the Warriors to six points in the third quarter before Morrison exploded in the fourth. 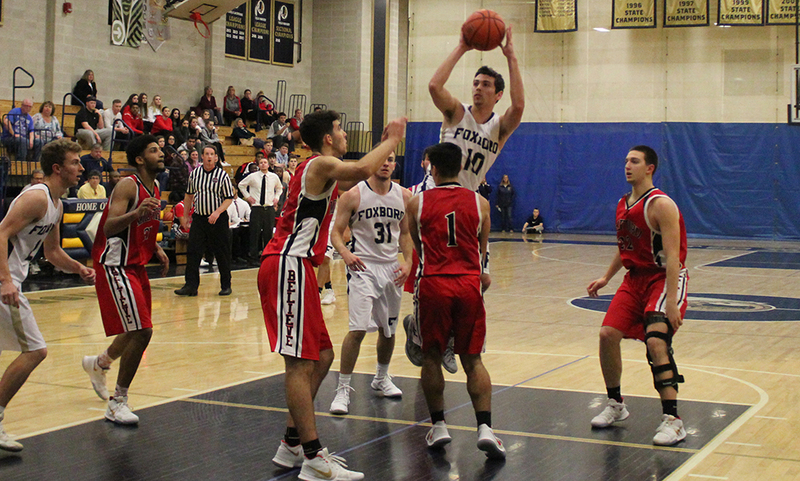 By rotating over on the weak side on Foxboro slashes, Milford took four charges in the second half, three from guard Joey DeMarco. Milford carried a lead into the fourth quarter and appeared to be in position to upset the Warriors, who entered the game at 8-1. Momentum shifted after the Scarlet Hawks were hit with a pair of technical fouls. Morrison drilled all four technical free throws and then a three-pointer on the ensuing possession to cap a seven-point possession, swinging a two-point deficit into a five-point lead. Foxboro held on from there. To negate Milford’s size, Foxboro played full-court, man-to-man defense throughout the whole game. 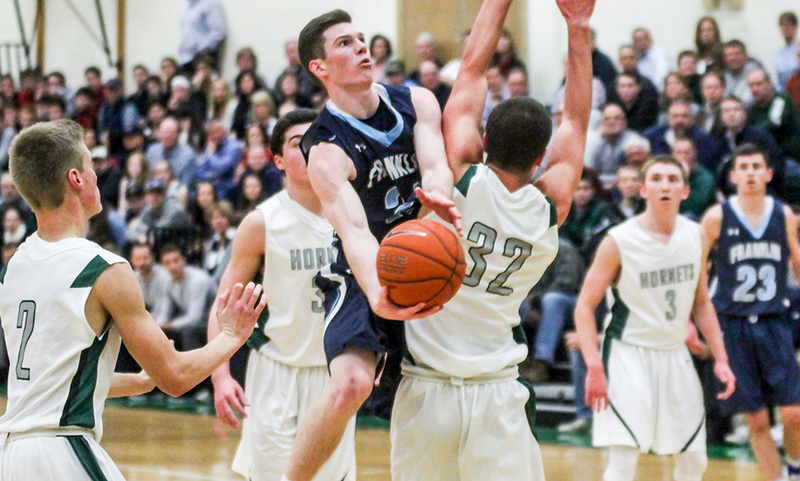 Senior Teddy Maher harassed the ball-handler and forced several turnovers. His “disruptive” play from 90 feet away from the basket wore down opposing guards, Gibbs said. By staving off Milford’s effort, Foxboro improves to 5-1 in the Hockomock, 9-1 overall. The Warriors will entertain Canton on Tuesday in a battle for first place in the Davenport division. Milford (2-4, 3-4) will look to bounce back when it travels to North Attleboro on the same day.